Monday night at 9:30pm, Arts host Xueli Wang will speak with MoMA curator Starr Figura about her current exhibition Gauguin: Metamorphoses. The interview will cover French artist Paul Gauguin's creative process, his Primitivist visions, his fascination with Tahiti and the numerous contradictions in his life and work. 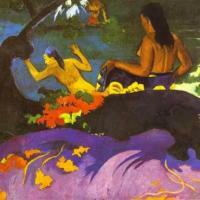 Gauguin: Metamorphoses is on view at the MoMA until June 8th.